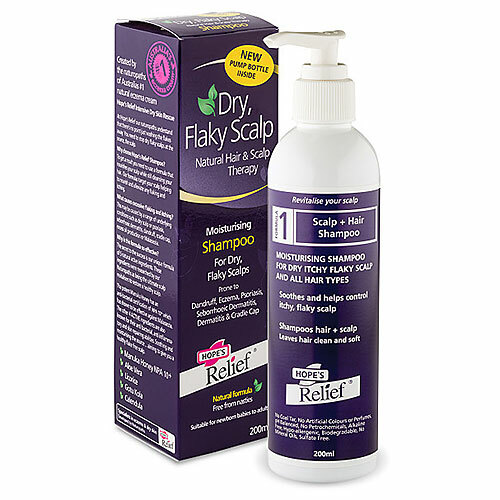 Hope’s Relief Shampoo is suitable for itchy flaky, scalps. It is gentle, unscented, pH balanced, hypoallergenic & sulphate free, so it is suitable for babies to adults. It contains hospital grade organic manuka honey NPA 10 + & other active ingredients. This shampoo also contains gotu kola, aloe vera, organic calendula and licorice root combined with the gentlest of cleansers to relieve itching. Wet hair thoroughly and massage the shampoo into scalp. Rinse well and repeat if desired. Unscrew the lid off the shampoo bottle and screw the pump into the shampoo bottle. For maximum results, use with Hope`s Relief Conditioner. Below are reviews of Hope`s Relief Shampoo - Dry, Flaky Scalp - 200ml by bodykind customers. If you have tried this product we'd love to hear what you think so please leave a review. Very thin and it doesn’t seem to have helped my psoriasis a lot. Quite expensive so expected more. Wasn’t sure at first as consistency is quite watery and on first use my hair was left feeling a little sticky however once I had worked out the right amount to use for my long hair (6 or 7 pumps) I was very pleased with this product. Noticed a difference to the psoriasis on my scalp after just a couple of uses and hair was left soft and shiny. Best of all natural product, plus no negative affect on my highlights. Good product. Bought for son. He reported that the shampoo appeared 'thin' on application and that it hadn't made a lot of difference to his scalp condition. Bit disappointing. I bought this for my teenage daughter as she has psoriasis of the scalp. It seems to have really helped to clear it up. I also use it on my two little ones aged 2 and 1. My 2 year old has eczema and this product has really helped him. I'll be buying more. Hope’s Relief Shampoo is suitable for itchy flaky, scalps. It is gentle, unscented, pH balanced, hypoallergenic & sulphate free, so it is suitable for babies to adults. It contains hospital grade organic manuka honey NPA 10+ & other active ingredients.